In this beautiful dish of sweet potatoes and brussels sprouts, two herbs were teamed together to bring out a delightful experience your taste buds will love! Rosemary and fresh basil are always favorites for many of my dishes and I especially love it in this one. The natural sweetness of the potatoes blends nicely with the brussels sprouts. Did you know sweet potatoes are very good for keeping your skin clear, smooth and young looking? The orange color in the potatoes comes from beta-carotene, an antioxidant that converts to vitamin A in your body and switches on DNA that is responsible for producing new skin cells and getting rid of old ones. That is an idea I love and we can all use smooth and clear skin. Brussels sprouts, believe it or not, have unique health benefits when it comes to your DNA as well. A recent study showed improved stability of DNA inside our white blood cells after daily consumption of brussels sprouts. The repair and protection of our DNA plays a critical role in preventing cancer and slowing aging. Also, our bodies detox system needs ample amounts of sulfur to work effectively and brussels sprouts are rich in sulfur containing nutrients. Eating these two foods 3-4 times or more weekly helps to improve your immune function, provide you with an abundance of rich nutrients, protects your DNA and helps your body to detox more effectively. I hope you love sweet potatoes and brussels sprouts as much as I do and will choose to add them to your diet, if you don't already. There are a few different ways to make this dish. You can steam the vegetables slightly and then mix with some olive oil, herbs, sea salt and pepper. Then bake for a short time at 350 degrees. 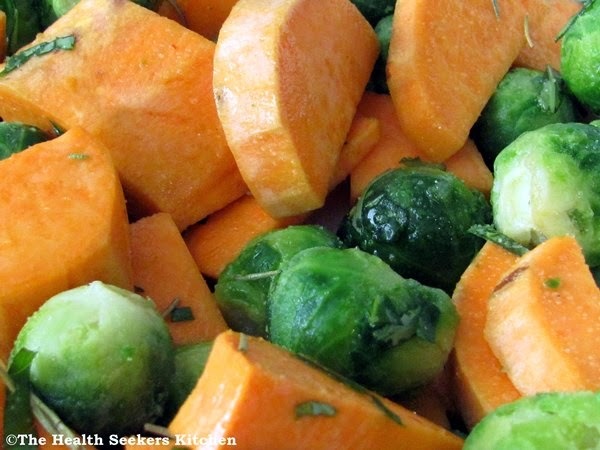 The other method is to peel and chop the sweet potatoes, mix with brussels sprouts, olive oil, herbs, sea salt and pepper and bake for 1 hour at 350. Both methods work great. Many diseases and health problems start with nutritional deficiencies. To avoid these deficiencies, fill up on foods rich in vitamins and minerals (like sweet potatoes & brussels sprouts) every day and limit or eliminate foods that have no benefit to your health. Peel sweet potatoes and chop into cubes. Mix with brussels sprouts, basil, rosemary, olive oil, sea salt and pepper. Place in 350 degree oven for approximately 1 hour. Do not overcook. As soon as the sweet potatoes are tender, remove from oven. ENJOY good health!! The users should check if steroids are being used in these creams that stimulate the process of effective of beauty products.